Now that we are settled down for the winter it is time to look back on our travel from Sweden to Sicily. What was special, what was strange, what went better? We have categorized our trip in different subjects, so let’s see. I was positively surprised how good the navigation ads are these days. Also the marks at sea were not as difficult as we expected . Most of the buoys were on the place they should be and sometimes there were buoys which were not on the map. 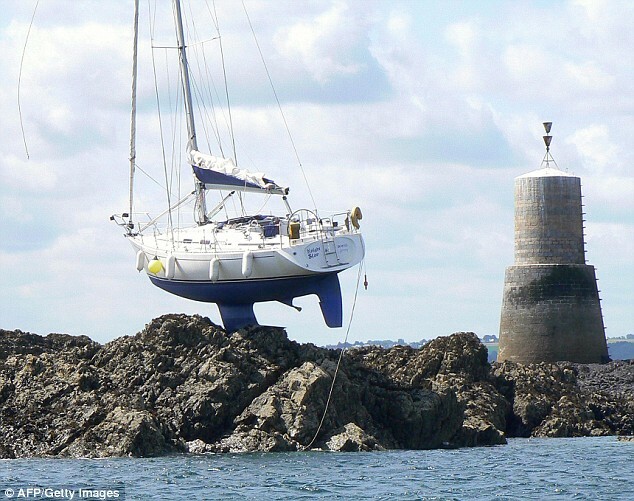 What was a bit difficult was the navigational warnings on the VHF. Difficult to understand if you don’t know the area. 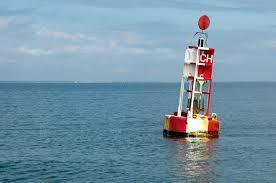 For example when we approached the Spanish coast there was a navigational warning about a buoy by Viveiro. When we entered the Ria of Viveiro we saw a red and white wing sticking up with a red ball connected to it. We used mostly large scale paper maps together with 2 electronical maps (Navionics on tablet and phone and OpenCPN on the board computer) and the pilot, which gave us very good information with descriptions and detail plans. 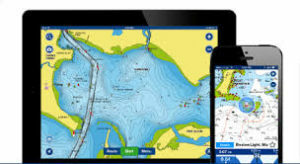 Also the Navionics digital map is very good and accurate and is updated all the time. Also the AIS system is a big help, especially at night or in fog. It is a pity that not all (fishing) ships are equipped with it, it would have spared me a heart attack. At the start I was impressed by the tidal waves along the French coast and the current that came with it. But after the first calculations I started to see the positive points and the big distances you could make when you used them in the proper way. Sometimes the speed of the current was impressive and the choppy waves it created also. Hoppetossa has proved to be a real passage maker. She behaves very smooth in the waves and none of us have been seasick. 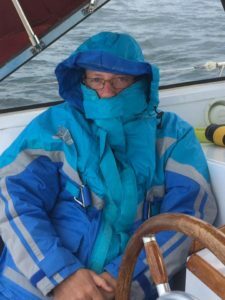 We knew she was a pleasure to live on but also during our sails it is nice to be on board. During our crossing of Biscay I made the double bed in our bedroom seaworthy by putting pillows und the edge so you were lying in a ditch and it was difficult to roll out, and it slept very nice. We didn’t encountered breakdowns. 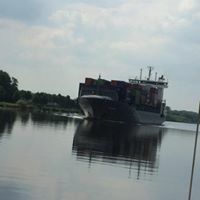 In the beginning the engine was shutting off after three ours but just before entering the Kiel canal we solved this (a persistent air bubble) and since then she has been working good. I thought the engine was smoking a lot but I found out it was burning motor oil because I filled her up too much (there are no markings on the dipstick so I made one and kept filling up). In the Baltic the rudder came loose from the hydraulic ram but that was a fix of 2 minutes (with a lot of complains from Germans in a sailing contest). Some things need attention though. The instruments are acting strange sometimes (wind meter is pointing in any direction and after 40m depth the meter says it is 5 m or so). The AIS needs an external GPS antenna because in higher waves the reception is really poor. Also the wind vane needs more experimenting. We left in the beginning of June from Sweden. The weather was fair but very cold in the night. The predictions were bad though. At a sudden moment I turned the pred,ction around. When rain was predicted it was a dry day. The winds were as expected, mostly from the southwest so we used every weather window we had. The summer started for real as soon as we were in France even though the wind was still not in our favor. That changed after Biscay. After Biscay the Portuguese North came. Sometimes hard and if there was less wind it was foggy (If Jill was standing on deck I could only she her when she smiled). As soon as we reached the Algarve holiday summer started. It was warm, the swell was gone and the wind was gone. We have not encountered storms yet. We had to use the engine a little too much but we don’t complain. 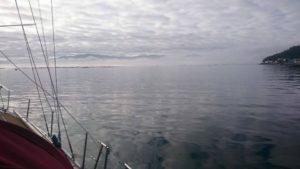 Sailing along the west coast of Europe the differences of coasts appear. The Baltic is a very friendly surrounding and the coast is lovely with nice places. The German bight is something different. The islands are beautiful but the sea is as busy as the countries by the sea. You can’t take much rest. The same is for the North sea and the channel’ but after that (the Atlantic coast) it starts to be interesting. The French coast is beautiful and very rocky. We loved to sail up the rivers and Belle Isle was beautiful. Our favourites were the Spanish Ria’s. They had everything you could wish for. 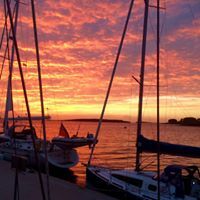 Nice sailing conditions, good anchor places, lovely villages with kind people and nice nature. You can spend the whole summer there and we will come back. The Portuguese coast was not easy. There was a lot or no wind and close to land the coffee was blowing out of my cup and the waves were high, all the time. At the moment w e turned to the Algarve all that changed. The waves were gone and you could shave yourself by using the water as a mirror. It was nice to go up the rivers but the harbours at the Algarve were not our favourites (and the ‘friet van Piet’ or the Swedish meatballs is not in our interest). The last piece of the Spanish west coast had to develop but it was o.k. 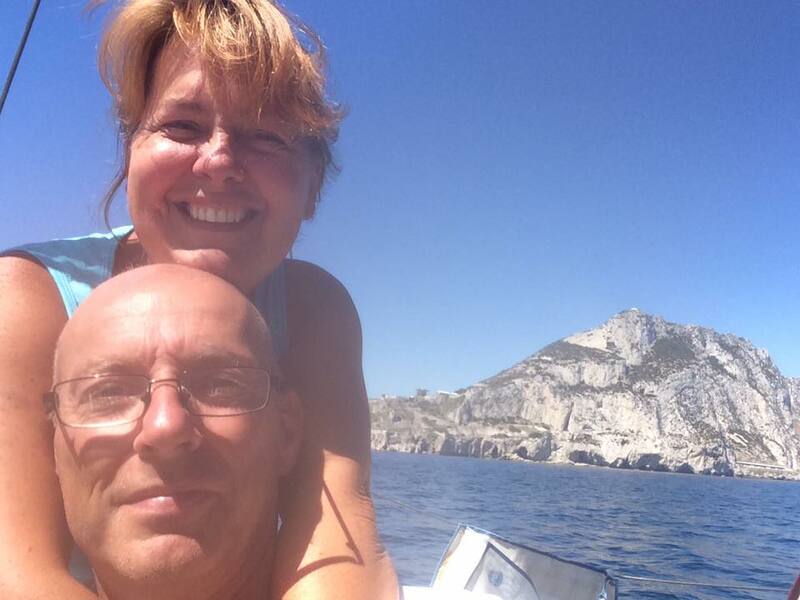 After passing Gibraltar and entering the Mediterranean Sea the Spanish coast was touristic, very touristic. No wind, no waves so not so much sailing. It may be clear this, just like the Algarve, was not our cup of tea. The Baleares were nice. 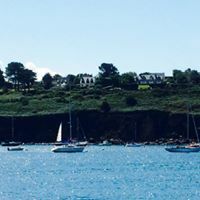 There are nice bays and the sailing is easy. We didn’t stay to long and maybe we go back later. The crossing to Sicily via Sardinie was nice. Not too much wind and not so much ships. I was impressed with the amount of wildlife we encountered. 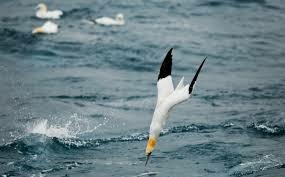 A lot of birds of course and sometimes it was spectacular to see how they dived. We also encountered a lot of fish on the flat sea sticking up their fins, It looked a bit strange. After France we encountered Dolphins on every trip, sometimes only 2 of them but mostly they were in big groups. It is always spectacular to see them jump out of the waves. Once we encountered a whale but it was too far to see which kind it was, it was not so big. 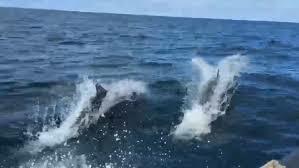 The trip was wonderful but we also had our oops moments and mostly they involved fishermen. Along the cost of France, Spain and especially Portugal fishermen put out a lot of fishnets and you don’t want them close to your boat. The nets are mostly marked with a flag or a little red ball but in France those could be dragged under water by the current. So you are sailing nicely and then you see the water next to the boat behaving strange and it is a fishing buoy dragged under water …ooops. 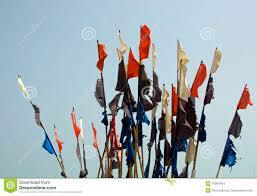 In Portugal there are so many fishing flags that it was like a merry go round sometimes! Sometimes those nets were marked with a little piece of plastic and every time we relaxed a bit we looked next to the boat oooops. The Fishermen also have the habit of switching off their AIS so their collegues don’t know where their nets are. That was not so nice in the very dense fog there can be along the Atlantic coast. We were sailing in the fog and suddenly 5m away we were looking at the bow of a fishing boat. No AIS and a minimal blip on the radar. It was so close I could see the fisherman had his flyers open and he was wearing underwear with little wales on it! I could even see the blowholes on the wales, that close ooops. Another oops moment was while we were anchoring. I don’t like to anchor to close to others so I pick out a point which I think, it is close but o.k. But the locals think, there will fit in 2 or 3 extra boats ooooops. And one time we were anchoring and the water was lowering and 30m from the boat something strange appears. It was a rock that, according to the map should be 200 m further ooops. Going from north of Europe to the south the culture difference appear. But generally people are nice to deal with. In most harbours people are willing to help but some harbours are a negative exception. We also found that the more expensive the harbour along the Atlantic coast was the less helpful the people were. 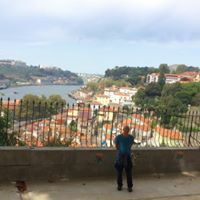 Exceptions were port Douro in Porto and Caiscais (expensive but worth it). We later found out that the Mediterranean was much more expensive with their harbours but there’s always Marineros to help (which is necessary). The quality of the harbours were good in general. In the north part (Sweden, Germany and Holland) most harbours we went to were small and coosy. In France most harbours were old and genuine but the quality was good. Further south harbours were modern. I still have to get used to anchoring but we like to anchor in the Ria’s in Spain. Very protected, good anchor ground and beautiful. Also the rivers in the Algarve were nice to anchor in, they reminded me a bit of the Waddenzee in Holland. After the trip we found time for the the things that didn’t work so well. The first thing was the windpilot. It didn’t function so well and after I had taken it off I found out there was a construction failure. The shaft had disformed in the bearing so it couldn’t move freely anymore. After talking to the manufacturer (which had moved to south Amerika) I didn’t want it to sent it in to them and went to the local workshop. I hope the fixes we did will do the trick, we see next summer. A universal joint has been sounding a lot and after inspection I found out it had a lot of clearance. The local workshop replaced it for me and the sound is gone. We found out the plug to grease it had broken off and it had not received new grease for years. The AIS had been acting strange. After inspecting it with the computer it looked like the GPS signal was going off and on all the time. After trial and error I found out the multiplexer did something strange. I updated the firmware and the problem was gone… hmmm. Also the windmeter is operating in the normal way again. For the rest just the regular maintenance (like that is not enough).